If you are like most business owners, CMOs, or content strategists, you sit down once a year or more frequently to design your social media strategy. The important question is, what are you doing during those planning sessions. Are you simply renewing the previous strategy and possibly adding some new social media marketing technology? Are you simply doubling your efforts in hopes that more is better? A solid content marketing strategy is gold. 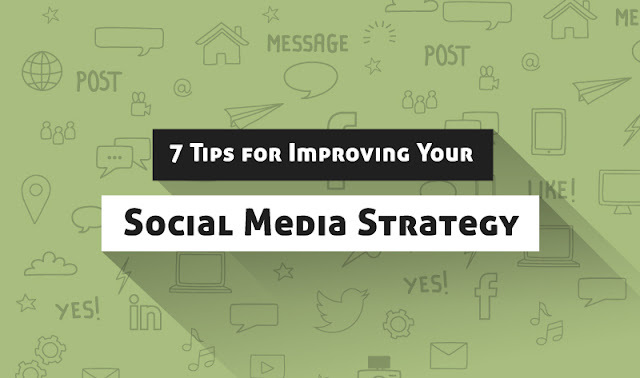 It provides the framework for your social media efforts, leaves room for improving those efforts, and provides a way to determine if the strategies applied are actually working. If your content marketing strategy is stale, ineffective, or incomplete, your social media campaigns will follow down the same path. To avoid this, check out these 7 tips for making your social media strategy better. Your overall social media strategy should begin with setting some big picture goals. Some examples of these might be increasing awareness of your brand, developing customer relationships, or establishing a market outside of your current geographical area. Then, as you plan specific campaigns, you can create more detailed objectives that relate to your big picture goals. One of the great things about digital marketing is that you can keep tabs on what your competitors are doing on social media. You can watch their campaigns unfold, witness how they are interacting with their followers, and see how they are utilizing technology. You can also see where they are succeeding and where they are failing. There is no denying the influence of social media on business nowadays. On one hand this is a great thing. You can use social media to reach entirely new customer bases, share information, educate, build relationships, and promote their products and services. Not only that, the response you receive happens in real time. This gives you the ability to make small adjustments as campaigns are unfolding based on the responses you receive. On the other hand social media makes it tempting to get as much content out there as quickly as possible. When this happens, quality can suffer significantly. Never launch a campaign that requires your team to create more quality than it can produce while still maintaining quality conversions. Obviously, the ultimate conversion is a sale. A request for contact by a representative or product information follows that pretty closely behind that. However, these aren’t the only conversions you should be considering. There are also micro conversions that indicate that you are gaining traction with potential customers. These micro conversion include signing up for newsletters, sharing your content, downloading white papers, and watching your videos. However, if you do notice that you have a big increase in micro conversions, but no increase in macro conversions, you may have content that’s not working for you in the way that you expect. It may be that people find your content interesting, but for some reason they are falling out of your sales funnel before you can truly connect with them. It’s impossible to tell whether or not a social media strategy is working, if there’s no way to measure it. While analytics software can and should be part of the process, it only gives a portion of the picture. There are also human factors to be considered. This would be direct feedback your customer service staff and salespeople receive, Wherever possible, use real numbers and real percentages as your measurements. Don’t rely on fuzzy amounts as measurements. A ten percent or higher increase in website traffic from the Southwest region of the United states is a useful goal to measure against. Some new traffic from the Southwest region is not. It is the combination of data, human feedback, and real numbers that will provide you with the information that you need to determine what is working, what needs to be modified, and what should simply be discarded. Depending on your branding and the products and services that you sell, you might only have a single demographic that is your target customer base. For example, women over 65. On the other hand, you might have a product or service with broader appeal. In this case, your overall customer base might range from 18 to 75. If this is the case, it is important to identify the different customer bases within that wide range to target with your social media strategy. This is because broad appeal, does not mean that a one size fits all marketing strategy is going to work for you. Your overall marketing strategy should involve creating multiple personas and identifying the needs and behaviors of each group you will be targeting. Then, as individual campaigns are rolled out, you can select which of the personas are going to be the focus. You will find that this makes your campaigns more memorable and more effective. Most of your content marketing strategy focuses on what you should be doing and where you should be active. This is great, but don’t forget that part of your strategy should include identifying places where you will not be focusing your social media efforts. This might include social media platforms where your customer base simply isn’t very active. It should also include platforms for which you don’t have the resources to dedicate. If you have a platform in mind that you must absolutely explore, consider paring back efforts on another platform, or making budget adjustments. The point is that if you cannot properly manage your presence somewhere, it is best not to be there at all. Courtesy of: Sproutsocial. H/T Adweek. Applying each of these tips should help you to ensure that your social marketing strategy has the biggest and most positive impact on your bottom line as it can. Norman Arvidsson, is a freelance web developer with more than two years of experience behind him and also a contributing blogger. Interest in such areas as web-design, web development, personal growth, leadership, SMM, and eLearning.